Made in America Pledge: All of our products are proudly produced in the United States by American companies. Some flashlight and watch internal mechanisms and materials are produced or sourced globally, however, they make up only a small percentage of the product, and contribute to the overall high quality and value of the item. If you know of innovative, American made every day carry essentials or accessories that you would like to make us aware of, please let us know here. Each individual has different daily needs, and EDC choices are very personal. Regardless of whether you are a minimalist, an obsessor, or somewhere in between, chances are you have certain items which you are almost never without when you leave your home. Some of us put on stout belts with pouches and gadgets strapped to our sides; others choose to carry items in a purse or small bag; still others carry items you would never know they have on them. If you were to sample the EDC items from 100 people on the street, you would find a number of core items – almost everyone carries a wallet of some sort, a method of carrying their keys, a phone case, maybe even a pocket knife or multi-tool, etc. The list is finite, yet it is nearly impossible to find all of these items in one place – and if you did, it would be a department store of some sort, not a specialized expert to help you make the right choices for your needs. EDC SpecialtiesTM sets out to change that. 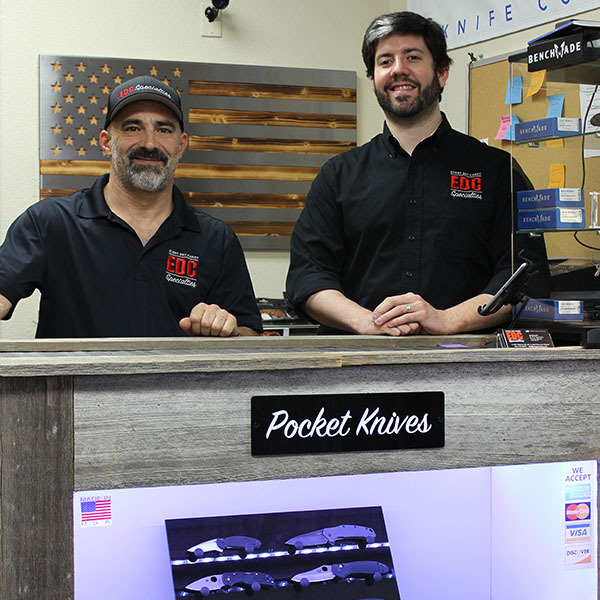 When you walk into our store or visit our website, you will find a selection of proven EDC items that our experts have first hand knowledge of, and stand behind. You will find guidance and information to make the right decisions for your EDC kit… or a loved one’s. Because EDC is personal, we believe it is important that we expertly know each and every product that we stock, and stand behind the quality and reputation of each. Our job is to ask questions and provide information to guide you in the right direction when choosing your personal EDC items, so that you can make informed decisions and be prepared for anything the world throws at you. EVERY DAY. Visit our store in Gold River, California, or shop with us online 24/7.